Fort Myers Luxury Homes For Sale: I welcome you to beautiful Fort Myers luxury homes, waterfront & riverfront homes & estates, river ranches along the Caloosahatchee River and in town locations, luxury villas & high rise condominiums. I specialize in international luxury real estate offering distinctive homes, condominiums, single family homes, villas, mansions & estates for sale. Emerson Square, Gateway, Gladiolus Preserve, Gulf Harbour Yacht and Country Club, Harbor Place, Harborage, Vistas, High Pointe Place, Iona Shores, Intracoastal Harbour, Jonathan Harbour, Laguna Lakes, Lexington Country Club, Lucaya, Mastique, Matera, Mcgregor Isles, Mcgregor Reserves, McGregor Woods, Miromar Lakes, Oasis, The Plantation, Three Oaks, Paseo, Punta Rassa, Reflection Lakes, Renaissance, Riva Del Lago, Riverside, Riviera, Sail Harbour, Sanibel Harbour Tower Condo, Shadow Wood Preserve, Shell Point, St Tropez, St Charles Harbour, Stonebridge South, Tanglewood, The Forest, Tidewater Island, The Landings, Caloosa, Town and River, Whiskey Creek, Whiskey Creek Estates, Winkler Estates, Old Fort Myers & the McGregor area & historic Downtown Fort Myers. I also offer the best in new construction in Fort Myers, Fort Myers Beach, Cape Coral, Alva, Sanibel, Bonita Springs & Naples, Florida. Ponce de Leon explored areas along Florida’s Gulf coast in 1513 & 1521. The barrier islands of Lee County are believed to be one of his many stops. Spanish and Cuban settlers created temporary fishing and farming camps along the coast, but for years Southwest Florida was an isolated area. In the early 1700s the Lee Island coastline first appeared with some accuracy in British maps. During the last half of the 1700s coastal areas of Lee County were a base of operations for pirates raiding the cargo ships sailing to and from the port of New Orleans. The Fort was abandoned in 1858 and reoccupied by Federal troops from 1863-1865. The Southernmost battle of the Civil War, a skirmish between Northern & Southern troops occurred across the river in 1865 and is reenacted annually at the North Fort Myers Cracker Festival. The fort itself was disassembled, and some of the wood used in construction of some of the first buildings in what would become downtown Fort Myers. No more than 10 families lived in the original town when it was platted in 1876. Herds of cattle were driven past the old fort grounds to Punta Rassa where they were lifted onto steamers and shipped to Cuba. Cattle, farming, and logging were early mainstays in the Fort Myers area. Tomatoes, avocados, and castor beans were cultivated on Sanibel Island. Many pineapple plantations flourished inland along the river as settlers began to move away from the fort area. By 1885 Fort Myers was bursting with pride and a bulging population of 349, the second largest town on Florida’s Gulf Coast south of Cedar Key. That same year Thomas Alva Edison was cruising Florida’s west coast and stopped to visit the village. Captivated with what he saw, Edison built his home and laboratory, Seminole Lodge, on the banks of the Caloosatchee River. He subsequently became Fort Myers’ most famous resident and a strong force in its growth and development. Edison had a deep respect for nature, regarding it as an endless source of discovery. Through his sheer determination and dauntless efforts, the beauty and majesty of the royal palms lining Riverside Avenue/ now McGregor Boulevard, were imported and planted, and would become the reason for the “City of Palms” nickname. Edison’s Fort Myers Laboratory was originally built for research on goldenrod rubber, but many of Edison’s inventions and research materials are on display. The incandescent light bulb is acknowledged worldwide as Edison’s greatest invention. Edison’s diversification remains a constant amazement. With almost 1100 patents to his credit, he has been dubbed “America’s most prolific inventor”. His achievements include the phonograph, movie camera and projector, ship-to-shore radio, alkaline storage battery, ticker tape machine, and microphone. As Edison’s enchantment with Fort Myers grew, he began to spend more time at Seminole Lodge and was often joined there by his friend, Henry Ford. The two distinguished inventors would sometimes go off on a camping trip or a drive to Estero. Ford met Edison at a meeting in New York and with Edison’s encouragement, quit his job and turned his full attention to his dream of building a gasoline driven automobile. By 1903 Ford’s dream had come true and he had become so famous that people were asking to put money into his company. The Ford Motor Company was officially started that year with $28,000 cash, but it took the introduction of the Model-T in 1907 to make the company a financial success. By 1914 the first Ford Car Dealership was opened in Fort Myers. Ford shared Edison’s enthusiasm for Fort Myers, eventually purchasing the property adjoining his friend’s estate and became a frequent winter visitor as long as Edison lived. Edison’s light burns a little brighter each year during the Edison Festival of Light, as the City of Fort Myers annually celebrates his February 11th birthday with two weeks of citywide events, culminated by the Grand Parade of Light. The celebration attracts thousands of visitors who view a colorful grand parade, join in street dances, and compete in contests ranging from fishing to shuffleboard. The King and Queen of Light area crowned at the coronation ball and reign at the Grand Parade of Light. During the building boom between 1898 and the 1920′s, torrents of winter visitors from the north flocked to Florida seeking their fortunes in land investments. The opening of the Tamiami Trail (U.S. 41) linked Fort Myers to Tampa and Miami, adding more to the growth of the Big Boom in the 1920s. Growth radiated in all directions until the 1930s. Two devastating hurricanes in 1921 & 1926, combined with poor publicity and inadequate planning brought a collapse in Florida’s boom time. Fort Myers suffered along with the rest of the nation during the Great Depression. Still, there was moderate progress as some of the more elegant buildings in Fort Myers were built during the 1930s. In the early 1940s, every county in Florida had air bases due to the advantageous flying weather. The Fort Myers area had Buckingham and Page Fields, and the city was home to thousands of servicemen, many of whom returned and became permanent residents. In the years, the city has grown along with Lee County and the rest of Southwest Florida. 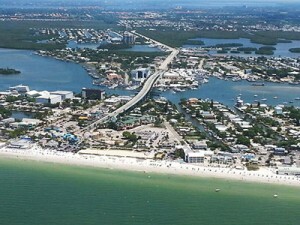 Commercial and residential growth has pushed development in all directions to create Cape Coral, North Fort Myers and Lehigh, as well as adding to the coastal settlements of Fort Myers Beach, Pine Island, Sanibel and Captiva Islands, and Bonita Springs. For discrete and professional service call me to schedule a private viewing of any one of these great Fort Myers luxury waterfront, historic homes, high rises, condos or upscale golf course villas, mansions & equestrian estates or river ranches for sale.